First of all, thanks for posting your question or comment here... I enjoy adding to the blog so much more when I know people are enjoying it and find it useful. Do you use a stylus with your ipads when the children are learning to write letters? FROM SUE: Not yet, but plan to. I had one stylus last year and have found one marker sized barrel one I want to try out. My issue is the price though, and my own personal stylus took a beating from my 3 year old the other day so I am nervous about buying them for students. My goal is to try to make my own... this link explains how. There are also several other methods too, along with videos if you do a search for make your own stylus. The change I will make is to try to use a large marker barrel instead of the thin pen so the size is more appropriate for K. I love the touch screens, but also want my kiddos to get used to writing letters and words with a tool. One thing I have encouraged for now is that the students curl their fingers under and support their pointer with their thumb while writing on the iPad so their hand is in a "pencil grip" form. Thanks for all of your ideas, I am putting them to good use already. I love the idea of a specific student using the ipad for the day. I will try it! I'd love to see a video of your entire set in action! I've found some on youtube and it has sparked some ideas. What are the 'logistics' of having a class set? Where do you store them? How does the syncing work? Charging them? Thanks for your blog and awesome work. Keep it up, you have a following! FROM SUE: Glad I could help and I hope you'll let me know how it's going. I will try to get some video to share- usually I am so busy I don't think of videoing, but I will try this week or next. As for logistics, it has varied over the past year. 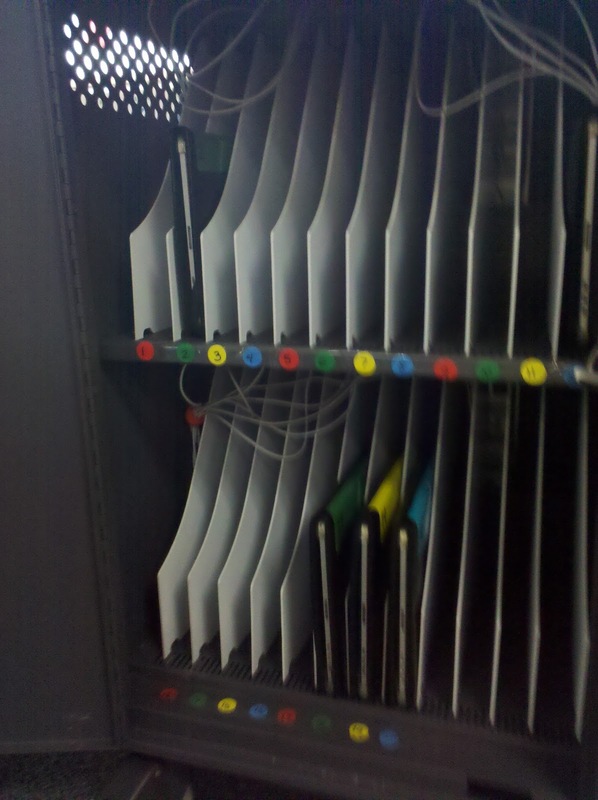 When I had six I used a metal file folder, and then for the first weeks with the class set I used 24 metal paper holders (I'd bought from Costco a couple years ago) that looked a little like the red paper organizer below, and now I have an official iPad cart. The cart provides security and easier charging. I have the iPads color and number coded to minimize confusion of whose is whose. I do all the plugging/unplugging. I've heard of iPads charge ports ruined because kids were plugging them in and jamming them the wrong way. I have the cords tied by a velcro strip and off to the side when not charging. Before the cart I charged about 6 each day, now I will charge every few days. This cart does not sync. Syncing continues to be a pain and I try to do it as little as possible. Now that you can download from the cloud, it is easier to load just a few apps at a time from the purchased icon in the AppStore, but I still dislike anything involving touching iPads one at a time. My school bought a 16 iPad sync "octopus" as they call it, but I did not find it any easier than syncing a couple at a time. Half the time they'd sync, half the time not. So I am trying to go with the set up I chose the first week of school and sticking with that until I have a significant change to make. I am probably futilely hoping ios5 will help make syncing easier. If you haven't been to Tony Vincent's site www.learninginhand.com you should check it out- he has great ideas for organizing iPads. THANKS AGAIN for letting me know I'm not just talking to myself here!